Superman's Pal Jimmy Olsen 4 & World's Finest Comics 75! SUPERMAN'S PAL JIMMY OLSEN 4, March/April 1955, was published around January 20, 1955. It contained 32 pages for 10 cents. Mort Weisinger was the editor. The cover was pencilled by Curt Swan and inked by Stan Kaye, featuring the third and final story of the issue, KING FOR A DAY. The first two stories of the issue were THE DISAPPEARANCE OF SUPERMAN and THE HUNTED MESSENGER. All three stories were eight pages long and were done by the same creative team: writer Otto Binder, penciller Curt Swan and inker Ray Burnley. This issue was reprinted in SHOWCASE PRESENTS: SUPERMAN FAMILY vol. I. WORLD'S FINEST COMICS 75, March/April 1955, was published around January 27, 1955. It also contained 32 pages and sold for a dime. Jack Schiff was the editor, and the cover was drawn by Curt Swan and inked by Stan Kaye. The Superman/Batman story was the twelve page story SUPERMAN AND ROBIN!, written by Bill Finger, pencilled by Curt Swan and inked by Stan Kaye. This story has been reprinted in WORLD'S FINEST COMICS ARCHIVE vol. I, SUPERMAN IN THE FIFTIES, BATMAN ANNUALS vol. II and SHOWCASE PRESENTS: WORLD'S FINEST vol. I. - THE WORLD'S MOST FAMOUS ARROWS, featuring Green Arrow, drawn by George Papp. - THE BATTLE OF THE MEDICINE MEN, featuring Tomahawk, which was pencilled by Bruno Premiani and inked by Ray Burnley. With the untimely death of comic book writer Dwayne McDuffie this week, I also mention two comic book titles he wrote which I read and still have those issues, ICON by Milestone/DC and DAMAGE CONTROL by Marvel. While DAMAGE CONTROL has not been collected in any reprint editions that I am aware of, ICON has been collected in two editions, collecting the first 32 of the title's 42 issue run. They are titled ICON: A HERO'S WELCOME and ICON: MOTHERSHIP CONNECTION. Jill Pantozzi, who writes THE NERDY BIRD blog at http://www.thenerdybird.com, and the column HEY, THAT'S MY CAPE at newsarama.com, mentioned some of her favorite comic book pros. She also proposed, for those on twitter, tweeting some of your favorite comic book creators, and using their twitter names @ if they are also on twitter. At the end of your post, add the hashmark #CreatorLove. Let's show our appreciation for those in the comic book industry while they're here to enjoy it, and re-read some of Dwayne McDuffie's great comic book stories. You can read Jill's full column at http://www.newsarama.com/comics/hey-thats-my-cape-mcduffie-appreciate-creators-110223.html . If you plan on going to MegaCon on March 25 - 27, 2011, contact me, and I hope to see you there! For more information about MegaCon, visit the convention's website: http://megaconvention.com. Next Week: SUPERMAN COMICS COVER DATED AUGUST 1958: SUPERMAN 123 & ACTION COMICS 243! In two weeks: SUPERMAN FAMILY OF COMICS COVER DATED MAY/JUNE 1955: SUPERMAN'S PAL JIMMY OLSEN 5 & WORLD'S FINEST COMICS 76! You can join the SUPERMAN FAN PODCAST and MY PULL LIST groups or pages on facebook, and follow both the podcast and blog on twitter @supermanpodcast. - The SUPERMAN PODCAST NETWORK at http://www.supermanpodcastnetwork.com/ ! SUPERMAN FAN PODCAST is at http://thesupermanfanpodcast.blogspot.com/ . Send e-mail about this podcast to supermanfanpodcast@gmail.com. MY PULL LIST is my spoiler free comic book review blog of the titles I read every week. It can be found at http://mypulllist.blogspot.com/. Send e-mail about this blog to mypulllist@gmail.com. Superman and all related characters are trademark and copyright DC Comics. Any art shown on this podcast is for entertainment purposes only, and not for profit. Thanks for listening to the SUPERMAN FAN PODCAST and, as always, thanks to Jerry Siegel and Joe Shuster. 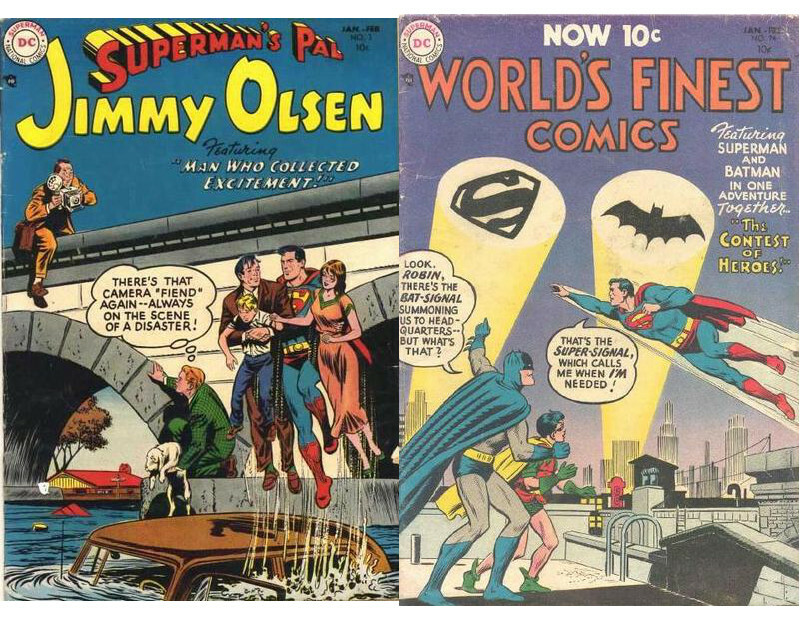 Episode #166: Curt Swan's Earliest Comic Book Stories! - EPISODE 2: MY FAVORITE SUPERMAN ARTIST: CURT SWAN! - Episode 61: CURT SWAN: I FLEW WITH SUPERMAN! - EPISODE 113: A CURT SWAN TOAST! The information for this episode comes from Wikipedia and MIKE'S AMAZING WORLD OF DC COMICS. Since only a few of Curt Swan's first stories for these characters or titles have plot synopses for them, this episode will feature a brief history of each character, group or title. For more information about the story, THE TRUE STORY OF BATMAN AND ROBIN in REAL FACT COMICS 5, November/December 1946, go to Bill Jourdain's podcast and blog THE GOLDEN AGE OF COMICS, January 3, 2009. - E-mail Editor Ian Sattler ian.sattler@dccomics.com. - In your own words, explain why you think DARK KNIGHT OVER METROPOLIS should be collected. - Be short and to the point, as well as polite. Don't be rude or demanding. - Mention that you heard it on FROM CRISIS TO CRISIS. It's not about ego for Michael and Jeffrey. It's to give a focused voice to our efforts. - MOST IMPORTANT: If DC agrees, pre-order the book when it is solicited so that DC knows to print enough copies. - follow FROM CRISIS TO CRISIS and the SUPERMAN HOMEPAGE at http://supermanhomepage.com for updates. - You will be able to order it through the SUPERMAN HOMEPAGE, or you can order it using the Diamond Order code at your local comic book shop. - It's important to show DC that we will follow through and actually buy this edition, so that they will be more inclined to reprint other storylines, not just for Superman, but other characters in the DC Universe. Next Episode: SUPERMAN FAMILY OF COMICS COVER DATED MARCH/APRIL 1955: SUPERMAN'S PAL JIMMY OLSEN 4 & WORLD'S FINEST COMICS 75! In 2 weeks: SUPERMAN COMICS COVER DATED AUGUST 1958: SUPERMAN :123 & ACTION COMICS 243! For more information about MegaCon, March 25 - 27, 2011: http://www.megaconvention.com/ . Join the SUPERMAN FAN PODCAST and MY PULL LIST groups or pages on facebook, and follow the podcast and blogs on twitter @supermanpodcast. SUPERMAN FAN PODCAST is a proud member of the LEAGUE OF COMIC BOOK PODCASTERS at http://www.comicbooknoise.com/league, the COMICS PODCAST NETWORK! http://www.comicspodcasts.com/, the SUPERMAN WEBRING of websites, and The SUPERMAN PODCAST NETWORK at http://www.supermanpodcastnetwork.com/ ! Any artwork shown with the show notes is for entertainment purposes only. I do not make any money from this podcast. Superman and all related characters are trademark and copyright DC Comics. 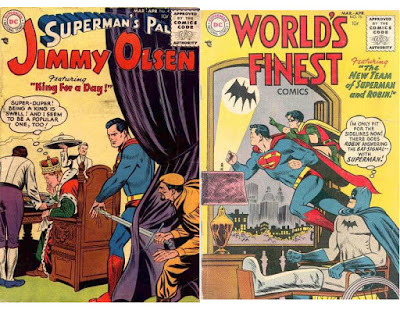 Episode #165: Superman Family Of Comics Cover Dated January/February 1955: Superman's Pal Jimmy Pal Jimmy Olsen #3 & World's Finest Comics #74! Superman's Pal Jimmy Olsen 3 & World's Finest Comics 74! SUPERMAN'S PAL JIMMY OLSEN 3, Jan./Feb. 1955, was published around November 18, 1954. It contained 32 pages for the cover price of 10 cents. Mort Weisinger was the editor. The cover was pencilled by Curt Swan and featured the third and final story of the issue, THE MAN WHO COLLECTED EXCITEMENT! All three stories were done by the same creative team, writer Otto Binder, penciller Curt Swan and inker Ray Burnley. These first two stories were similar to two episodes of THE ADVENTURES OF SUPERMAN TV show. WORLD'S FINEST COMICS 74, Jan./Feb. 1955, was published around November 30, 1954. It also contained 32 pages for the cover price of a dime. The editor was Jack Schiff. The cover was pencilled by Curt Swan and inked by Ray Burnley. - Superman/Batman: THE CONTEST OF HEROES (10 pgs.) was written by Bill Finger, pencilled by Curt Swan and inked by Stan Kaye. - Green Arrow: GREEN ARROW'S KID BROTHER, (6 pgs.) was drawn by George Papp. - Tomahawk: GRAY WOLF'S REVENGE, (6 pgs.) was drawn by Bruno Premiani. Elsewhere in DC Comics, 30 titles carried the cover date of January, or January/February 1955. 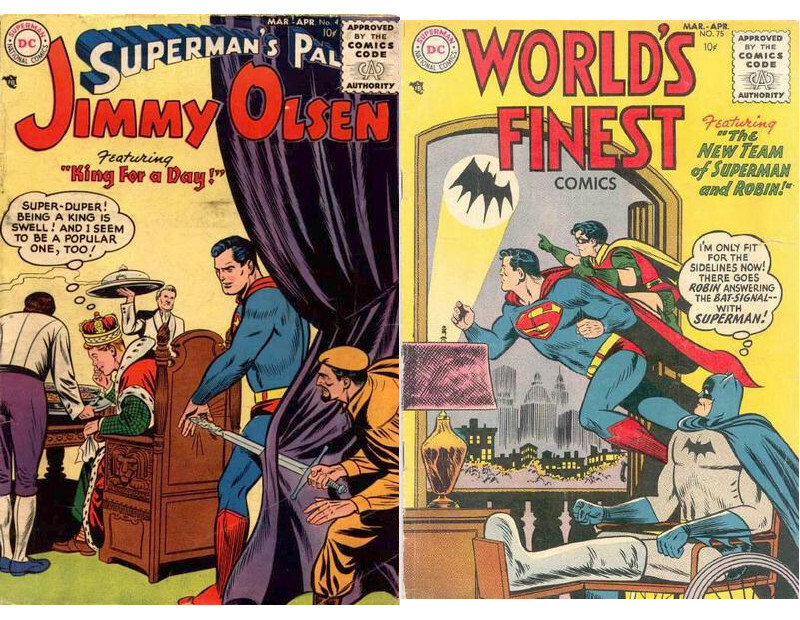 Next Episode, in honor of Curt Swan's birthday: CURT SWAN'S EARLIEST COMIC BOOK STORIES! In two weeks: SUPERMAN FAMILY OF COMICS COVER DATED MARCH/APRIL 1955: SUPERMAN'S PAL JIMMY OLSEN 4 & WORLD'S FINEST COMICS 75! And in three weeks we will return to our look at the Superman titles cover dated August 1958: SUPERMAN 123 & ACTION COMICS 243! Episode #164: Superman: Serial To Cereal! 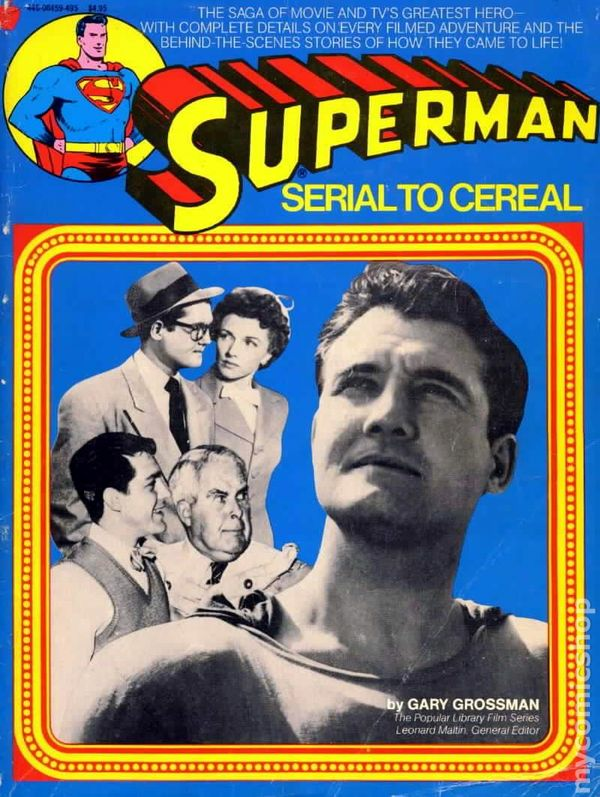 Superman: Serial To Cereal by Gary Grossman! SUPERMAN: SERIAL TO CEREAL was written by Gary Grossman, and published by Popular Library in August 1977. The book chronicled the history of Superman on the screen, from the movie serials of the 1940's to the TV series of the 1950's. Gary Grossman covered the history of movie serials, the development of the two Superman serials, as well as the ADVENTURES OF SUPERMAN TV show. He explored the careers of the principal producers, directors and actors involved in the various Superman productions, with plenty of personal anecdotes from everyone. At the back of the book was an appendix of complete credits to the serials SUPERMAN (1948) and ATOM MAN VS. SUPERMAN (1950), and THE ADVENTURES OF SUPERMAN TV series. - Kirk Alyn: EPISODE 43: KIRK ALYN & GREGORY REED: SUPERMAN ACTORS! - George Reeves: EPISODE 55: HAPPY BIRTHDAY, GEORGE REEVES! -Phyllis Coates: EPISODE 56: A DOUBLE FEATURE: HAPPY BIRTHDAY, PHYLLIS COATES! / THE SUPERMAN COMIC STRIP! - Noel Neill: EPISODE 102: HAPPY BIRTHDAY, NOEL NEILL! Next Episode: THE SUPERMAN FAMILY OF COMICS COVER DATED JANUARY/FEBRUARY 1955: SUPERMAN'S PAL JIMMY OLSEN 3 & WORLD'S FINEST COMICS 74! In two weeks, in honor of Curt Swan's birthday: CURT SWAN'S EARLIEST COMIC BOOK STORIES! Two weeks after this episode we will return to out regular look at the August 1958 cover dated issues of SUPERMAN 123 & ACTION COMICS 243. SUPERMAN FAN PODCAST is a proud member of the LEAGUE OF COMIC BOOK PODCASTERS at http://www.comicbooknoise.com/league and the COMICS PODCAST NETWORK! http://www.comicspodcasts.com/, the SUPERMAN WEBRING of websites, and The SUPERMAN PODCAST NETWORK at http://www.supermanpodcastnetwork.com/ !